Sony (Booth C11001) took the wraps off some additional new products for NAB 2018, including the HDCU-3100 camera-control unit, which adds SMPTE ST 2110 support for the HDC and HSC families of studio cameras, and the world’s first 4K three-chip camcorder with ½-in. Exmor R CMOS sensors. The additions join previous announcements as Sony highlights the ways in which its efforts around cloud-based workflows and IP are redefining its traditional reputation as primarily a provider of top-notch production equipment. Sony is launching two 4K camcorders at NAB 2018. The PXW-Z80 camcorder can record 4K images at 50/60p at 4:2:2 10-bit and with S-Log3 or Instant HDR workflows. It also has Sony’s Electronic Variable ND filter and a 17X zoom lens and advanced face-detection auto focus. Users can select “Face Priority AF,” convenient for automatic face detection and optimization, or the newly introduced “Face Only AF” for more demanding 4K shooting applications. The 17x zoom lens and three independent control rings with end-stop allow manual control of focus, zoom, and iris for quick and precise adjustment. The camera (as well as the PXW-Z190) also makes use of Sony’s unique Electronic Variable ND filter that allows greater exposure control by varying the density of the ND filter during shooting while maintaining resolution and depth of the field. The camera also supports S-Log3 and Sony’s Instant HDR workflow. The PXW-Z280 includes advanced network features to enable a secure, seamless wireless Electric News Gathering (ENG) workflow and it is planned to be available in July for $6,950 in the U.S.
And, for those looking for a more cinematic look, the FS5II is a 4K Super 35mm compact professional camcorder that literally puts 4K high-frame-rate recording with Instant HDR in the palm of the hand. Sony’s efforts around IP will be front and center, and, according to Deon LeCointe, marketing manager, production switchers, Sony Electronics, the move to the SMPTE ST 2110 standards will be a major focus, with the company continuing to work with standards bodies on finalizing standards around features like device discovery (identifying what model or type of equipment is being connected via IP) and connection management for things like redundant failover. “Our legacy product lines are getting SMPTE 2110 built into the existing camera-control units or baseband processors,” says LeCointe. “And, by the end of April, the XVS production switchers will support 2110 by virtue of the availability of 40-Gbps board upgrades. Our goal is to have an upgrade from 2110 HD to 2110 4K operations and, for those who need to do 4K today, to deploy a system that is a hybrid of our own NMI standard and 2110, with 2110 handling the HD and NMI the 4K. The HDCU-3100 brings IP support to a Sony camera control unit. The HDCU-3100 camera control unit exemplifies the push to IP as it meets the growing industry demand for IP. The 1.5U size of the compact fiber camera control unit brings IP capabilities to Sony’s system cameras, from the 4K HDC-4300 with BPU-4000 series, including the new BPU-4500A, to the HDC-2000 series and HSC fiber system cameras. Combined with a new HKCU-SFP30 option board, the HDCU-3100 is able to support SMPTE ST 2110.The essential functionalities required for live production including tally, intercom and return video can all be provided through IP. The support of NMOS IS-04/05 is planned for the future. 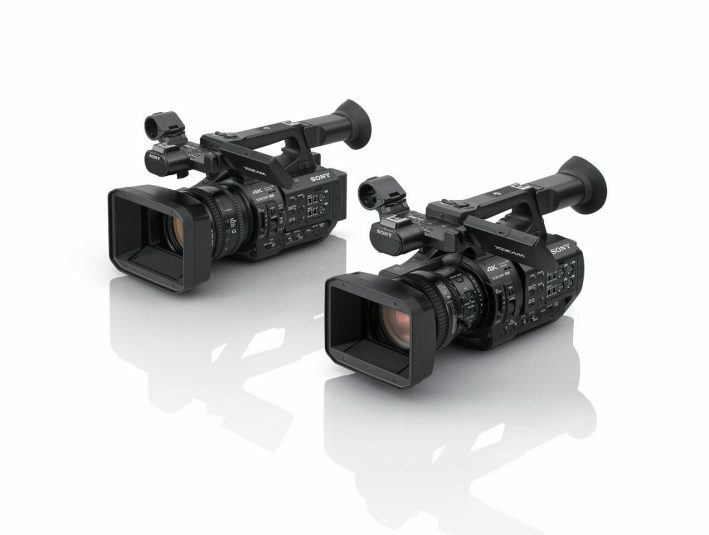 The HDCU-3100 is equipped with a maximum of eight built-in SDI outputs, including four 3G-SDI outputs. Support of 12G-SDI will also be available for the HDCU-3100 in future updates with the combination of the HKCU-UHD30, 4K/HDR Processor Board and HDC-2000 series system cameras. An LED color indicator shows the status of optical transmission on the front panel with different LED colors to optimize operability. The HDCU-3100 is planned to be available in April, with the complementary HKCU-SFP30 ST-2110 option board planned to be available in July 2018. Additional HKCU-UHD30 4K/HDR Processor Board and HKCU-SDI30 12G-SDI interface options are expected to arrive later in the year. The new XVS-9000 production switcher enables up to four channels of 4K 3D DME for live 4K production with a variety of video effects. At NAB 2018, Sony’s booth will offer a demonstration of the use of ST 2110 for long-distance remote production, which is increasingly of interest to sports-production teams at networks around the globe. In a recent Sony test, a production-switcher control surface was in London, and the core equipment was in New York. Sony’s XVS-9000 production switcher was introduced at NAB. 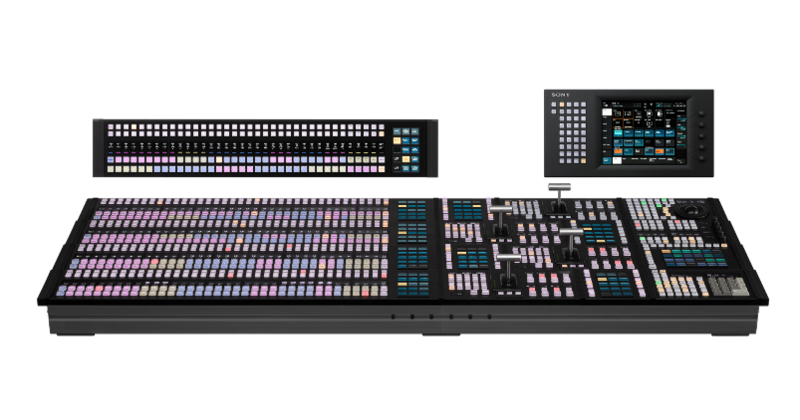 The new XVS-9000 production switcher has up to 80 inputs and outputs for 4K production needs and 160 and 80, respectively, for HD demands. Up to four newly developed 4K/HD DME boards can be installed into one XVS-9000 switcher, enabling configuration of up to four channels of 4K 3D DME for live 4K production with a variety of video effects. It also inherits the functionality and operability of the current XVS series, including the well-known operation through the ICP-X7000 modular panel with OLED display. It will be available in October. According to John Studdert, VP, U.S. sales and marketing, Sony Electronics, Sony’s Media Solutions Division is responding to the need for more end-to-end workflows and applications and leveraging the long-lasting relationships that have been built around hardware like cameras, production switchers, and monitors. For example, wireless capabilities built into Sony cameras now allow low-resolution proxies to be streamed to the Sony Ci cloud platform and transcoded into whatever format is needed for editing and content creation. If someone wants to import a file to Avid in the DNX HD format (or to another editing system or format), the file is transcoded on the fly as it is played out of the camera and into the cloud. Users of Ci are already asking for new features, such as the ability to automatically transcribe the content based on the low-resolution files as they come in, a move that saves time in the production chain. And enhanced integration with the Sony Navigator X media backbone provides additional synchronization between on-premises storage systems and the Ci cloud platform. Sony is also rolling out a cloud-based service for disaster recovery of master-control operations. With the unprecedented number of natural disasters occurring in the U.S. and beyond, more and more TV stations are at risk of being knocked off-air. The master-control efforts are a result of Sony’s acquisition of Crispin Automation and combine Crispin’s expertise in master-control automation with Sony’s Ci platform. Other new cloud-based features include the ability to help clients launch cloud-based OTT services or manage global streaming rights. And a new Live Session feature provides real-time synchronized playback of content so that an executive producer or another member of the production team can review and approve it from anywhere in the world. HDR will also be a major emphasis at the Sony booth, with content creators committing in a big way to having original programming created in UHD and HDR. There will be three areas of focus for HDR: SR (Scene Referred) Live, which is useful for productions that do not have the time or staffing to handle color correction; File-Based HDR; and Instant HDR. Netflix, Apple iTunes, and Amazon, for example, have already made a major commitment to HDR, and, in many respects, Netflix is driving much of the demand for HDR for live event production. For at least the past year, it has committed to HDR not only for original comedies and dramas but also for events like comedy concerts. SR Live is a complete line of HDR equipment designed to provide production tools that can be deployed for both traditional HD needs and next-gen UHD demands. The SR Live line is complemented by the Instant HDR workflow, which can do HDR without the need for color grading.